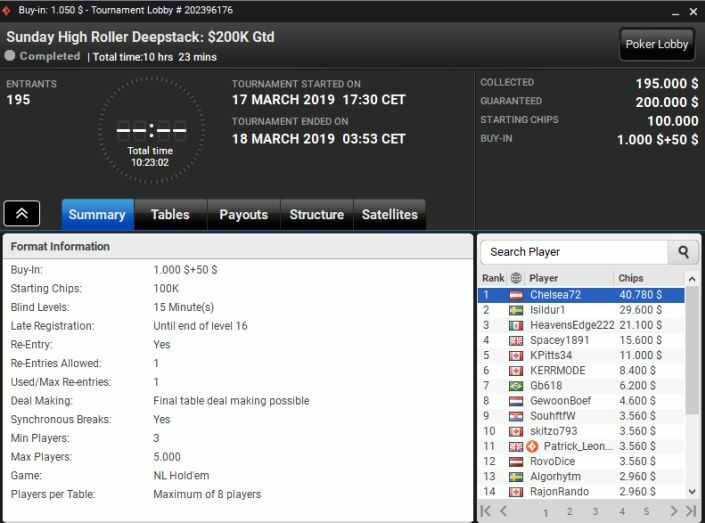 Starting with Viktor Isildur1 Blom’s near miss, the $1050 buy-in Sunday High Roller Deepstack saw 195 runners and a multi-national field as usual, Canadian and UK flags flying deep. Patrick Leonard was one of those with the Union flag next to his name, the popular partypoker man eventually bowing out in 11th spot, while Belgian pro and poker organiser Kenny Spacey1891 Hallaert managed an excellent 5th place under the UK banner – good for $15,600. Moving up the stakes, to the $2100 buy-in Sunday High Roller Gladiator, and that man Patrick Leonard was again deep in the mix when the big money appeared, but he could only improve by one position on his earlier cash – another $8500 or so in the kitty. With the flattened pay structure that partypoker recently introduced in the Bounty events – also rake-free on the bonus headhunting element, another recent change for the better – it was Chance ChanceSeeYou Kornuth who emerged with the huge win. Splitting $47k with Dario madgenius87 Sammartino meant an excellent ROI for both men, but Kornuth’s $43k+ Bounty payment dwarfed all his rivals’ bankroll boosts. The $1050 Sunday High Roller Bounty Hunter saw another hard battle, with partypoker’s Kristen Bicknell and Finnish legend Juha Helppi both edging towards final table appearances. It wasn’t to be for either star, however, otherwise decent 11th and 13th spots respectively the best they could muster, and it left the door open for another anonymous highstakes online grinder to take down the tournament. ATM_Mage saw off the dual challenge of UK’s BackDoorMat and CooperKupp to land just over $40k and his biggest win of 2019 so far, the $24k Bounty element again proving to be the big difference in paydays. There were 736 entries for the $320 buy-in version of the Sunday Gladiator, with $250k guaranteed, split between a $133k regular prizepool and $117k for the Bounty fund. …but it came down to Finland vs Sweden for top honours, and tikidiii16 emerged victorious over Doyle_B for a $30k+ win. 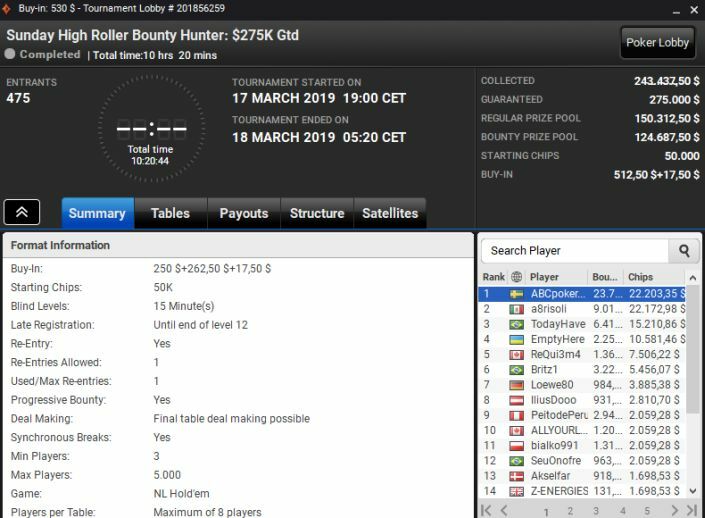 Last, but not least, we had the $530 Sunday High Roller Bounty Hunter, which attracted 475 entries and proved to be the longest game of the day at over 10 hours. This time Sweden did get the victory after two near misses, with ABCpoker911 landing not only a very sweet $22k plus change for the win, but also another $23k+ more from the Bounty prizepool. Mexico’s a8risoli scooped over $30k as runner-up, while Brazilian grinder TodayHave today has (!) an extra $20k in his or her bankroll. That’s it from the big partypoker Sunday major grind this week, but we’ll be back with the biggest and best of the action again next week!